The Oniscidae are a group of terrestrial isopods with a well-developed frontal line across the head. Characters (from Vandel 1973): Cephalon with strongly marked frontal line, with three projecting frontal lobes, one medial and two lateral; supra-antennal line generally well developed, sometimes reduced or absent. Pleurepimeres with ovoid glandular fields, usually small in size, rarely elongated. Pleon continuing directly into pereion without interruption; neopleura large, spreading, falciform. Antennal flagellum consisting of three articles. Endite of maxilliped without penicil. Genital apophysis simple, not bifurcated. [B35] Bowley, E. A. 1935. A survey of the oniscoid genus Phalloniscus Budde-Lund, with a description of new species. Journal of the Royal Society of Western Australia 21: 45–73. [BP03] Brandt, A., & G. C. B. Poore. 2003. 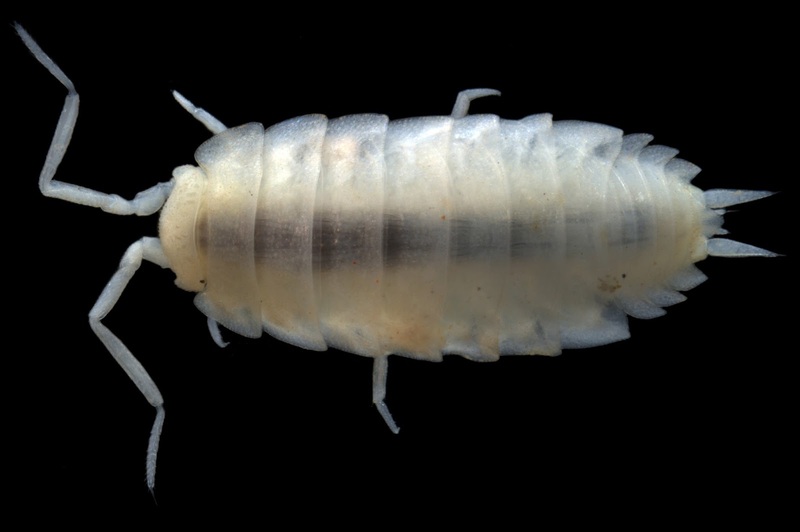 Higher classification of the flabelliferan and related Isopoda based on a reappraisal of relationships. Invertebrate Systematics 17: 893–923. [D01] Dollfus, A. 1901. Isopodák [Isopodes]. In: Horváth, G. (ed.) Zichy Jenő Gróf Harmadik Ázsiai Utazása [Dritte Asiatische Forschungsreise des Grafen Eugen Zichy] vol. 2. Zichy Jenő Gróf Harmadik Ázsiai Utazásának Állattani Eredményei [Zoologische Ergebnisse der Dritten Asiatischen Forschungsreise des Grafen Eugen Zichy] pp. 371–374. Victor Hornyánszky: Budapest, and Karl W. Hierseman: Leipzig. [H47] Hatch, M. H. 1947. The Chelifera and Isopoda of Washington and adjacent regions. University of Washington Publications in Biology 10 (5): 155–274. [M90] Muchmore, W. B. 1990. Terrestrial Isopoda. In: Dindal, D. L. (ed.) Soil Biology Guide pp. 805–817. John Wiley & Sones: New York. [V73] Vandel, A. 1973. Les isopodes terrestres de l'Australie. Étude systématique et biogéographique. Mémoires du Muséum National d'Histoire Naturelle, Série A, Zoologie 82: 1–171.